When an anime series titles itself Gangsta, you may have an inclination that violence will be a recurring theme (especially when you view the teaser trailer from funimation) but what you might not guess is that it’s primarily a character-centric tale with two characters that are spectacular protagonists. The series focuses in on Nicholas Brown and Worick Arcangelo, two men known as “Handymen” or mercenaries who take the jobs that are passed on by even the deadliest of individuals. These Handymen are enlisted by the most dangerous mob bosses or law enforcement to accomplish whatever dirty deed needs to get done – usually involving death in one way or another. Nicolas and Worick live in the city of Ergastalum, a bustling location that was at one point a supposed “safe haven” for Twilights (essentially a super-human born from the product of a unique drug.) When you determine that someone important to the series is a Twilight and is now being hunted down by an elite underground faction, it seems like being a Handyman might not be enough to survive what’s coming. As the series promises, a struggle for power commences that can be felt through various parties with many different motivations, but more than anything it is the overwhelming sense of concern you feel resonate for Nicolas and Worick in the midst of a chaotic city erupting with trouble. When evaluating Nicholas as a character, he has a majority of the interest in his corner – instantly becoming a different take on a character that could have been crafted generically. Nicholas is deaf (I think that may be a first for any anime series or anime film I’ve seen) that adds some authenticity to how it affects his life in intense scenarios – all while filling the role of lead protagonist. Once scratching the surface, fragments of his life growing up begin to come to light and you see the compassion, power and examples of a complex character find a balance in Nicholas (arguably the best attribute of Gangsta the series.) During the exploration of who Nicholas is, his childhood ties are prevalent to the series ongoing narrative making the series one that evolves wonderfully through each episode. Though Nicholas may sound as if he holds the entire weight of the series on his shoulders, there is some especially surprising depth that comes from his counterpart Worick. Worick would be written off as the aid to the series lead in other animes, but Gangsta gives Worick the chance to recall both who Nicholas is/was but how he contributed to things that helped Nicholas. Worick definitely has unsung hero qualities, but for the most part he’s celebrated by fans through the expression of his role that viewers solely witness. It’s rare for a series to have two central characters that work so well together but it’s those opposite traits and through thick and thin partnership that the pair proves to have complete chemistry. If anything, the bond between Nick and Worick is electric and will 100% be the reason you are enticed to continue with Gangsta. The twists of childhood traumas, abuse and much more may add turns to the series but the grounded stance it takes with these two men and their partnership is a dazzling attribute to watch. One person I seemed to have left out (who is in the series often) is Alex, the ex-prostitute with a bounty on her head and a blooming crush for Handymen. It’s not to say she wasn’t enjoyable in some capacity, but she felt underused and more one-dimensional than the men of the series which is more of a semi-fault in the creation of her role. (Jessica Chastain needs to give her ‘do better’ speech to anime creators from time to time.) 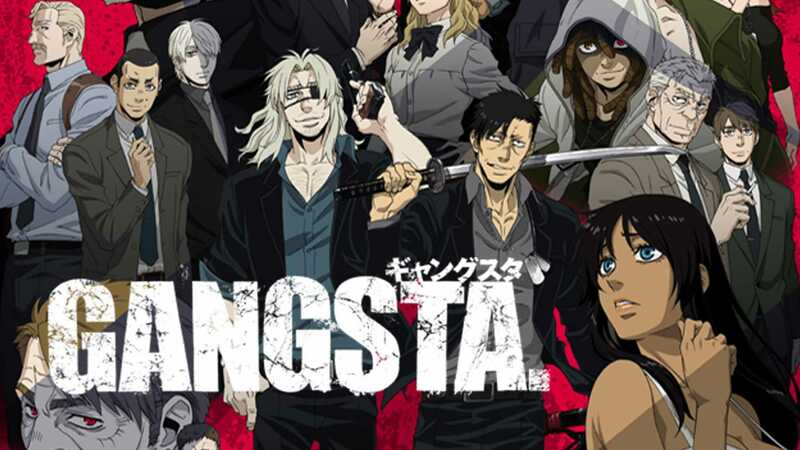 The animation of Gangsta feels lively despite evoking those darker or neutral tones – creating a unique approach given today’s anime standards and a strong final product from the animation company. The english voice cast of the series feels like a straightforward delivery which is how the world of Gangsta would feel, often avoiding getting too over the top. There are a few little hiccups in Gangsta, but when everything is taken into account – Gangsta is a series that introduces two instantly memorable characters in a gritty world, and I loved my experience throughout it. – The bond of friendship (maybe more) between Nick and Worick was the ace up Gangsta’s sleeve. – I would say I want season two but Manglobe Studios filed for bankruptcy and things seem much bleaker for any follow up. When it comes to anime series that fall under the fantasy genre, they can be either a major hit or massive miss depending on the direction of the genre title, but one series strays some the simplicity of your traditional fantasy series by the name of Grimgar, Ashes and Illusions. The initial premise of Grimgar is set following a young Haruhiro, a young man who (along with the rest of the population) doesn’t remember anything about where he came from or who he was in the past. Our hero next is thrown into the fantasy driven world by being drafted into the “Volunteer Soldiers” that pits him against a slew of creatures and problems that nobody could truly be prepared to enter blindly. On a positive note for Haruhiro, he finds out he won’t be alone on this crusade against creatures, joining a team of misfits that all play their own role in an ensemble setting. The positions on the volunteer soldiers squad try to add a diverse skill-set to even out the strengths ranging from squadron leader who deals with the tactical strategies to the healer who aids the other warriors before during and after battle with their enhanced abilities. The team dynamic alone makes it feel like nearly every character serves a purpose in the world of Grimgar, Ashes and Illusions even if you have to invest the time to discover it. In the anime series, just as you think you begin to understand the dynamics and relationships amongst the crew, the series throws a few twists and turns to keep viewers on their toes. One of the most absolute thrilling and impressive traits Grimgar, Ashes and Illusions has to offer is the incredible growth that its characters go through from the first moments of the series all the way to the final few scenes of the first season (seriously hoping there will be another follow up.) 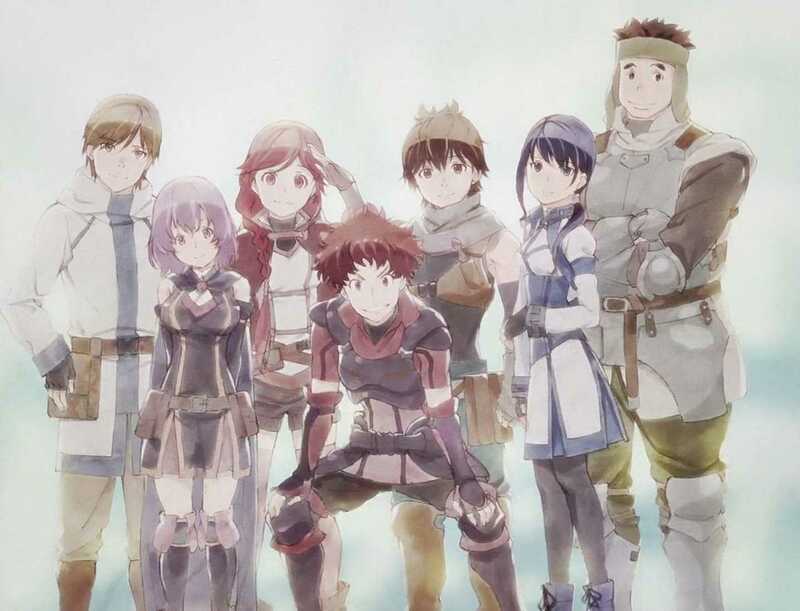 You essentially stumble across these outcasts who aren’t valued for much, but form a tight knit bond that seems improbable at first – in essence becoming a genuine connection that blossoms over the duration of Grimgar, Ashes and Illusions. One episode in particular (episode 7, “They Were Called Goblin Slayers”) best summarized that progression of the group, offering not only one of their best episodes, but a superb standout episode of anime series in general that is a powerful contribution to the medium by solely focusing on those changes. Though the character development offers many strengths to the series, the characters themselves could spark a variety of reaction to viewers. The group consists of men and women (a nice change given the male driven anime casts) that partake in an equal opportunity for battle. Some of the female characters are prone to the overt fanservice and inappropriate portrayal which is my only true frustration from Grimgar, Ashes and Illusion. With that being said, the female characters actually provide a necessary role to the group aside from the generalizations of anime – often proving to be rather useful. Our lead hero Haruhiro becomes one remarkable young man who gives his all to be the best leader, comrade and friend to his companions, enjoyably exploring his inner self from beginning to end. A character by the name of Manato, the healer, leader and morale boost for the group who plays a major role in the anime despite a lack of physical presence that leaves a heavy impact on others (myself included). Others like Mary (a girl with a dark past and grim outlook) or Moguzo (the heavier set tank of the group with a heart of gold) flesh out Grimgar, Ashes and Illusions the way a properly structured anime series should aspire to achieve. If you have found that you enjoy an assortment of people who make the story worth watching, Grimgar is a series that is wholeheartedly worth the effort and time. The animation quality for Grimgar, Ashes and Illusions brings watercolors to life in this vibrant series with dazzling artistic creations to be in awe over. The night sky is recurring throughout the anime and provides pure beauty in those moments that never grow old. The design of the characters and backdrops are unique enough to feel like it avoids the usual anime tendencies, with the only flaw being the art that depicts the creatures they fight – however that surprisingly isn’t a major concern granted all of the series exceptional traits alongside the production. The English voice cast fits each role with ease and precision to create the proper atmosphere their characters embody, showing us that all signs point to Funimation taking time and caution with what is undoubtedly one of their best new series to have under their renowned name. – I can’t believe how attached I became to these characters with such surprising depth. – Loss is felt during this anime, but it’s the way they deal with this loss that left me impressed and grieving simultaneously. – As much as I want to view a second season, I am worried that it will get darker for the lovely group of warriors. His identity as an Ajin becomes public knowledge which instantly endangers Kei’s life, adding a bounty to his head and sending many powerful government sects after him. Fortunately for Kei, his longtime friend Kaito is present and helps Kei flee from hunters, police and all of those who may want to obtain the Ajin. The two embark on this hectic new adventure together, trying to keep each other alive and ahead of all the parties that have plans for Kei as the newly discovered Ajin. With the government making moves to control Ajin (including a girl named Izumi who is an Ajin covering Ajin affairs) comes the pro-Ajin movement led by Sato – a former marine who now despises mankind and its sympathizers hell bent on corrupting Kei. From a narrative perspective, Ajin jumps in head first into the drama and action the series totes in the premise. From the very first moments, you know there is a sense of urgency that follows the plot throughout this tale. Ajin can draw a variety of reaction from the fans of the anime that builds momentum with viewers, but one implausible argument is that the series is slow. The quick pacing could sometimes be a deterrent for some, but Ajin doesn’t feel as if it’s throwing too much conflict at the viewers (more of a surface issue tension that will be elaborated on later in this review.) If anime that doesn’t waste time attracts you, Ajin has plenty of intense instalments to keep you guessing at what could come next – that is except for repeated death and Kei being in danger of course. As I mentioned earlier, Ajin carries a decent amount of issues and obstacles for its protagonist, but sometimes it feels like a missed opportunity to discuss anything past government conflict, abuse of power and new territory for the primary character who is realizing what it means to be an Ajin as it goes on. Just because it uses tropes that have been seen before doesn’t mean anything especially negative because Ajin is still a series with a lot of significant successes, but in the future exploration of the series and or films should scratch deeper than the surface that we’ve come to know during the initial first season of 13 episodes. By following Kei and Kaito (who have a Tokyo Ghoul Kaneki/Hide relationship) the series does provide an investment worthy thrill-ride to see how they can navigate and overcome the various troubles that are popping up left and right. Ajin offers great potential overall, sometimes it is used to its best and others can leave us waiting for a bigger picture – nonetheless, Ajin is an impressive series that will most likely grow with more time. The true attribute that sets Ajin apart from other horror animes and many series in general is the animation techniques used to bring Ajin to life. In series like Fullmetal Alchemist, scenes with 3D animation are placed inside to add a different approach – but Ajin is completely done in this 3D animation. If anything, the animation is probably peoples biggest gripe or favorite inclusion to the anime, drawing a polarizing response from anime fans and critics. Initially it was my main hesitation going into Ajin, not having enjoyed the first look at the animation but to be fair, it actually has moments where the creative decision makes sense. Several fights feel like clever pieces to the series where the 3D technique isn’t something that was done just because they could – they want to serve a purpose. Ajin also finds it’s niche in darker tones to fit the grim atmosphere created by death and carnage, even down to the opening and closing themes as evidence that Ajin is created to have a bleak image that is felt from beginning to end. Ajin is definitely an anime that at a glance could certainly be off putting to viewers, but if given a chance you will find there are enough horror, action and conflict to keep you coming back for more. – The formula has familiarities to other animes over the last decade but enough originality to keep it from feeling recycled.